Today I have an exciting new feature we are rolling out on Glamour and Grace! I have asked my good friend Sarah Montes, illustrator and crafter extraordinaire, to come and share a fabulous new DIY idea each month! This month she is sharing something really unique that I know you all will love! I will let Sarah take it away! Greetings Glamour and Grace readers! I’m so excited to being doing today’s DIY post! 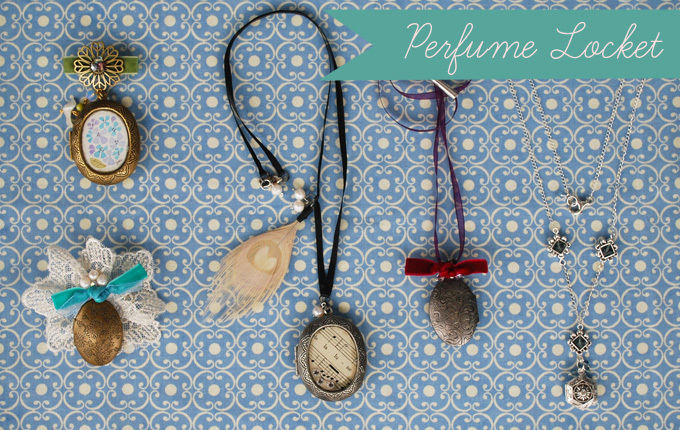 When Megan asked me to do a “how-to” project for you, I knew immediately that I wanted to share my ideas for these charming perfume lockets. It’s something I haven’t seen much of, and is a simple project for even the busiest of brides! The best part is how customizable you can make these. My inspiration comes from an adorable perfume locket I found at Anthropologie a few months ago. It’s such a great idea for today’s bride (or bridesmaids!) who have limited purse/pocket space, and this project does double duty as a functional accessory that is pretty and will keep you smelling lovely at the same time. I just knew it would be the perfect DIY project for any bride looking to have something unique and eye catching, and that can even be amended for a groom or groomsmen. Just use an empty pocket watch casing instead of a locket, and work it into a boutonniere with some manly smelling essential oils. I’ve included the solid perfume how to, and some photos of different style of lockets to get your creativity jumpstarted! Happy crafting! Step 1: Using a cutting board and a knife (preferably items that you don’t mind getting waxy) cut one of the beeswax blocks into shavings. I ordered my beeswax from Honeyrun Farms, an Etsy shop that sells their homegrown honey, beeswax, soaps and candles. One of their 1 oz blocks equals about two tablespoons of beeswax. Step 2: Once the beeswax is in thin shavings, put it into the jar with the olive oil. Place the jar into a sauce pot with about an inch or two of water in it, and heat on medium to low until the mixture is completely melted. Step 3: Use the skewer or straw to stir and help break up the beeswax until it is smooth. Take off of heat. Step 4: Measure out 20-40 drops of essential oils. I did this beforehand into a small dish so that I could immediately pour it into the wax/oil mixture without it having a chance to set up. Since I did a Lavender Vanilla scent, I used about 15 drops of Pure Vanilla Extract (yes, the kind you use for baking! Imitation vanilla will not substitute here) and 20 of Lavender essential oil. Stir well into the mixture. Step 5: Once the scents are mixed into the beeswax mixture, very carefully begin to pour into the lockets. I wrapped a towel around the jar since the wax was still really hot. Fill the lockets up to the edge of the hollow part, being careful not to overfill. If it gets into the part with the latch, it’s okay, the clasp will still lock since it is a soft wax. Fill both sides if you want, or leave one side open for a photo. Step 6: Let the perfume solid sit for about 30 minutes. It should be dry to the touch, and you can just swipe your finger across and apply! **You may find that throughout the process of making the perfume that you stop smelling the scent you’ve put in. Don’t worry, your nose has just adapted to it. You will be able to smell it after being away from it for an hour or so. 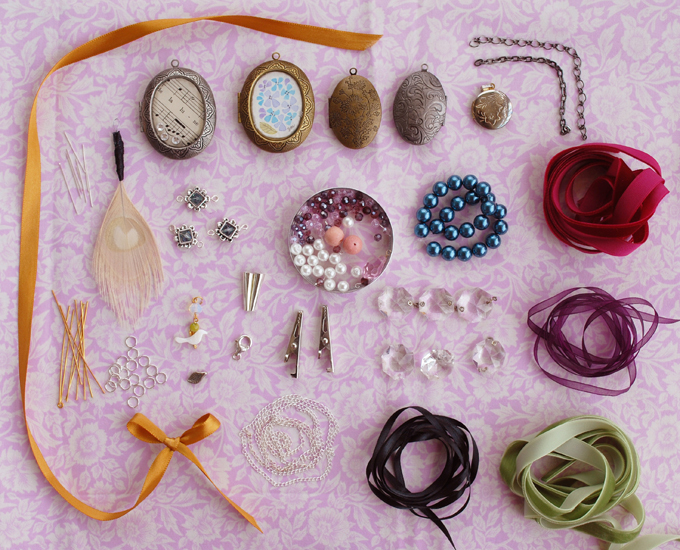 For the jewelry, assemble the materials you will need for your lockets. 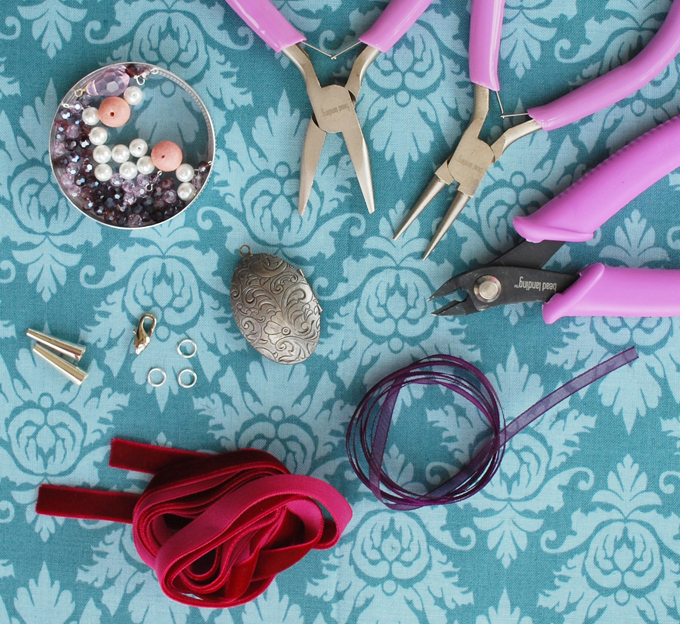 Think of what you want to make: a necklace, bracelets, brooches, something to pin to your bouquet, etc. I find that sketching out some ideas first helps a lot, then you can know exactly what materials you need, and you have a sort of blueprint to follow as you assemble your jewelry. Also consider the style of your wedding. Do you have a lot of vintage elements? 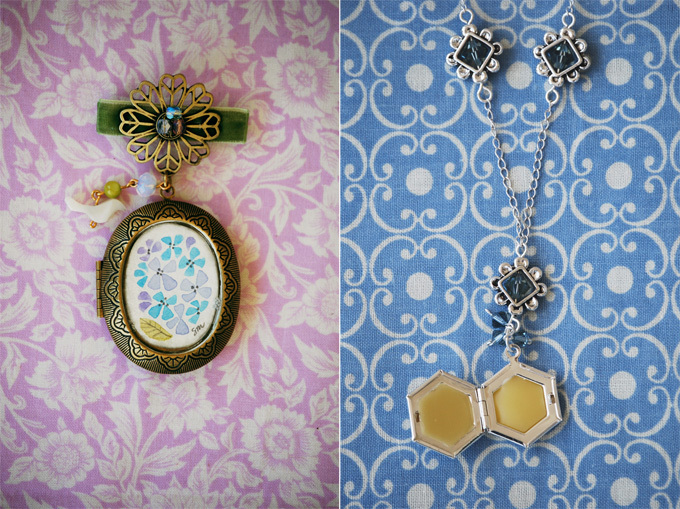 You might want to find lockets with a nice patina, paired with lace and some vintage glass beads. Do you love classic style, a la Audrey Hepburn? Go black and white with some white peacock feathers and pearls. Are you giving these as gifts to your bridesmaids, or mother of the bride? Make each one different, perhaps adding a small charm that represents something about the woman you are making it for. Choose lockets that are a bit larger to get the best results. Small lockets will work, but they will not hold much perfume. I’d suggest keeping the size to about an inch or larger. Have fun scouring antique stores and flea markets or even Ebay for vintage lockets and findings. This will be more expensive though, so check local craft stores for supplies as well. I found my lockets at Michael’s and Joann’s and paid an average of $4 per locket. You will also need a good pair of wire cutters, round nose and flat nose pliers. You can buy a jewelry tool kit at craft stores for about $15, or just raid your fiance, boyfriend, husband or dad’s toolbox! **If you’ve never made jewelry before, try searching Google or YouTube for some easy how-to tutorials and videos.You can find a lot of basic techniques and tips to help you get started. Or simply slip your finished locket onto a pretty chain or ribbon and voila! instant necklace! Once you have all of your materials together and a plan for your lockets, put on your favorite wedding movie and some comfy pj’s and get started! If you like any of the lockets you’ve seen here today, head on over to my Etsy shop! Huge thanks so Sarah for this awesome DIY! Such a great idea! Sarah will be back next month for another DIY treat, so be sure not to miss it! Such a great idea!!! Go Sarah!! I just posted this on my FB fan page (BudsandBloomsElegantAccoutrements); this is without a doubt, the coolest DIY I've ever seen on a wedding blog. I'm totally going to make one of these! Thanks for this cool project. Wow that's impressive... makes me wanna get crafty!! Oh wow, this is AWESOME! Love it!! Such a great idea!!! Thanks for sharing! these would make amazing bridesmaid gifts!! Wow...I haven't seen one of these since I went through my great-aunts jewelry box as a little girl. What a lovely idea and such a simple DIY project. Thanks for sharing. OMG this is awesome!!! So darling ;-))) Thrilled about the new monthly DIY ~ yay!!! This is SO fun! I love it and can't wait to see more DIY's! This is so creative ~ what a brilliant idea! Thanks so much for sharing the instructions. I've never seen this idea before! Great idea! Love the vintage feel. My readers/brides would go gaga over these. L-O-V-E!!! These would make amazing bridesmaid's gifts! I loved this! I can't wait to see what she brings next month! Beautifully done and so professional...are you for hire? Ingenious! What an amazing idea and a great tutorial! I just featured it on DIY Weddings at Craft Gossip. Thanks for sharing! I shared a link to this on my blog, because we are all about music, and I love the locket with the sheet music inside it! So pretty! These are a great idea! I'm impressed! Having inherited my mother's vintage locket recently, I will definitely be trying this one. Thanks!! Really sweet idea (: I like it a lot. I love this idea, i am going to make my own lavender solid. Too cool. I saw this was tweeted yesterday by WSPNews! I was able to find all of the ingredients needed to create the perfume on www.wholesalesuppliesplus.com. I also found an old locket from my grandmother. I can't wait to create this unique project! Thank you for sharing! This is probably the single most ingenious DIY that I've seen so far. And I LOVE diy gifts! Thanks for sharing your idea! Just wondering, where did you get all those lockets? They look really good! Also, how much does one cost on average? Such a fun DIY project for any budget!